race design | The Dark Side of Digital Art. 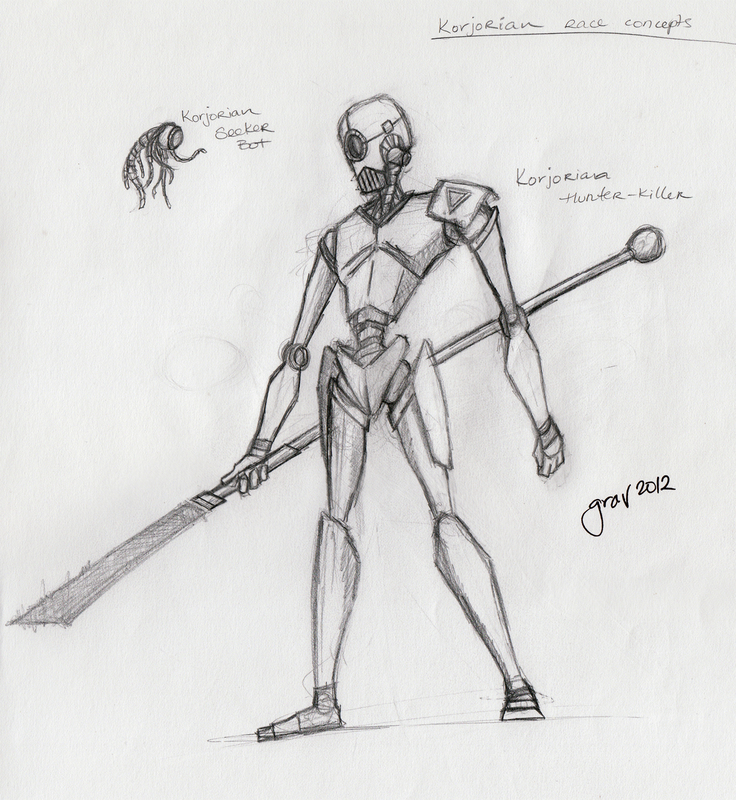 The Kor’Jorian are another race of Savaged. Often modern authors play with the concept of man attempting to become God, and the repercussions of those actions. From the “Terminator” movie series to Michael Crichton‘s Jurassic Park novels. This concept is something that fascinates us; as our technology level increase it is a boundary that we flirt with on an almost daily basis. From cloned sheep to the exponential advancement of computer processors, it is possible (in our minds) that at some point soon man might be able to create life. This brings up a load of fears, will our creations become us? Just as we have become gods in creating them? Will they replace us, as we are seeming to replace our gods? The Kor’Jorian address this fear in my science fiction world. In a much different way, as these are not man’s mechanical monsters, nor are they purely mechanical constructs, but what has evolved from a biological creature merging with their technology. The Jori were a hive race, made up of clusters of semi intelligent multiple cell organisms, each about the size of bacteria. As the hive clusters grew in size their intelligence level increase exponentially, some of the larger hive groups (about the size of a basket ball) are considered hyper-intelligent. Their hive clusters often splitting and merging with other clusters allowing an entire population to share the same experience or focus on the same tasks. In their ancient past the Jori encountered another space faring race, and were forced to defend themselves. As a race without conventional bodies,and were almost exterminated, before they created their mechanical bodies. The Kor’Jori were born. In the Eons since their race was forced to inhabit Mechanical bodies, the Jori have evolved considerably. Now longer are the clusters large, their science and technology advanced enough that smaller clusters and even single organisms have expanded their abilities through artificial means. At times it is hard to distinguish whether there is a even a surviving biological component to some Kor’Jori. The Kor’Joirans have ruthlessly protected their planets for Eons, forever paranoid that another race will try to subjugate or destroy them. Often seen as warlike, unfeeling machines, they have little to no contact with other races, and often when they do it is violent in nature. Look for their spacecraft in my next post.